Q. Why can't I access this article online? If you cannot access an article online and would like assistance in retrieving it, please email library electronic services at lib-systems@fuller.edu, or click "report a broken link" (see bottom screenshot). 1. We have electronic access to the desired journal, but not the issue with the desired article. When we have electronic access to any issues of a journal, a link to our journal holdings usually appears on the worldcat record for all of that journal's articles, even if we don't have access to that particular article. 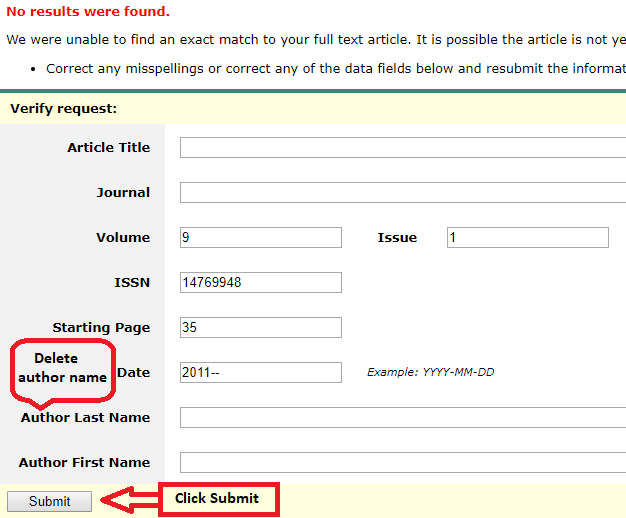 If an article link does not take you to the desired article, check to make sure we have access to that particular volume/issue of the journal. You can do this by clicking the article/journal title to view its detailed record. If you look under "Access Online" you will see all the database links through which the desired journal can be accessed. Under "Database / coverage" there will usually be a date range covered by that particular database. If the publication date of the desired article is not within the date range of any of our databases we do not have electronic access to that article. In the example below, ProQuest has access to the journal from 1998 to 2006. A second related issue could be a journal publishers use of an embargo, or moving wall. Some journal publishers block electronic access to their titles for a certain number of years (usually 1-5). This ensures that their journal content can only be accessed via print for that many years. Click here for information about requesting scans of print articles via ILL. In the example below, JSTOR has an embargo of 3 years on this Journal, since you can start accessing issues from 4 years ago. 2. The article record has database links to the wrong journal (misleading links). Sometimes articles are linked to the wrong journal in one of our databases. This happens most frequently with Open Access (OA) journals, because we do not have permission to edit the way these journals link in our catalog. If you click "view full text," and are brought to the wrong journal, check to make sure we actually have electronic access to the desired article's journal/serial (and that its issue/volume is covered as explained above). In some cases a mis-linked journal is placed on top of the correct link in the "access online" listing within the article's detailed record (the "view full text" link goes to the first link in the listing). Review all the links listed under "access online" to find the database that has the correct journal and volume coverage to view the desired article. In other cases, OA links will appear with articles for journals that are not held by Fuller at all. 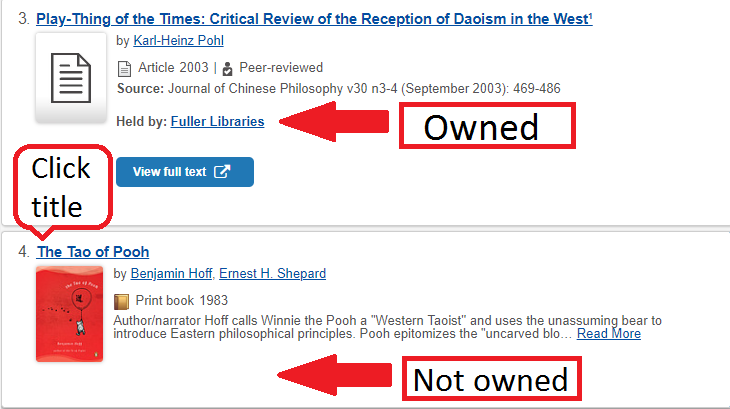 In these cases, not only will you not find the proper journal under "access online" in the record details, but the main record will not say "Held by: Fuller Libraries" (see screenshot below). 3. The article record has the proper database links, but the article can't be found or an error message appears (bad/ broken links). If you receive a "no results" page from EBSCO, try deleting the author's first and last name and resubmitting the search. Sometimes this allows the article to be retrieved from the database properly. If that doesn't work, go to the the databases page on the Fuller library website and try searching the article title in the appropriate database directly (ATLA, ProQuest Religion, etc.). In some cases it is more efficient/effective to search the journal title in browzine (our eJournal management software) to access the desired article according to its volume and issue. If none of the above solutions are working, it is possible that proper access is being denied due to a service disruption or error with one of our vendors. In this case (or if you do not feel comfortable troubleshooting on your own), please feel free to use the "report a broken link" feature next to the appropriate database listing in the item's detailed record (see screenshot below), or to send the library an email at lib-systems@fuller.edu. The electronic service department will provide you with access, or an update on your request, as soon as we can.